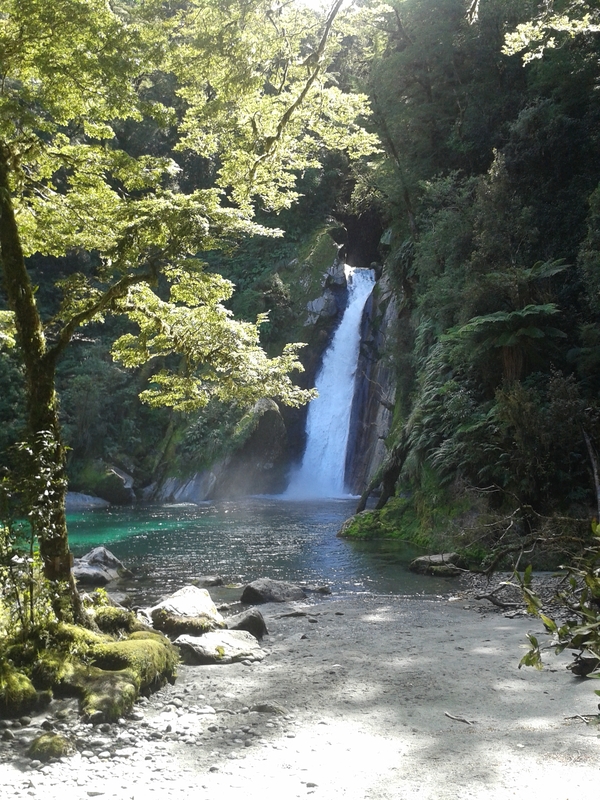 This is the last instalment in my account of walking the Milford Track last month. If you’ve just joined me, you may want to read Chapters One – Three before this one. Breakfast was followed by goodbyes. 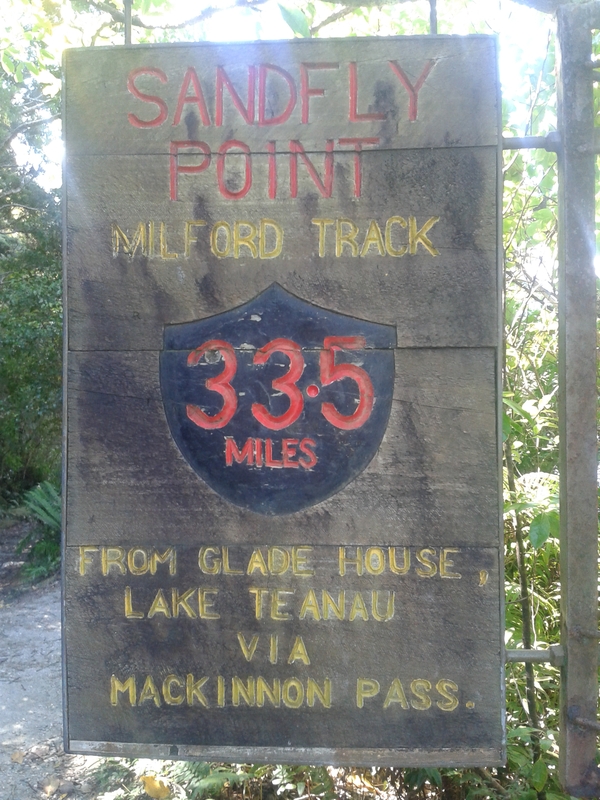 We were all departing at different times for Sandfly Point, where a boat would leave for Milford at 2pm, 3pm and 4pm, and many of us would not see each other again. I felt quite teary as I hugged Darth Vader, Mountain Goat and Hot Bird. They were booked on the 2pm boat, I on the 4pm. I didn’t want to rush on that last day. I wanted to savour the beauty and solitude and slowly disengage from my adventure without pressure. This turned out to be the most difficult day of all, due (in part) to decidedly undignified reasons. But let’s start with the good stuff. 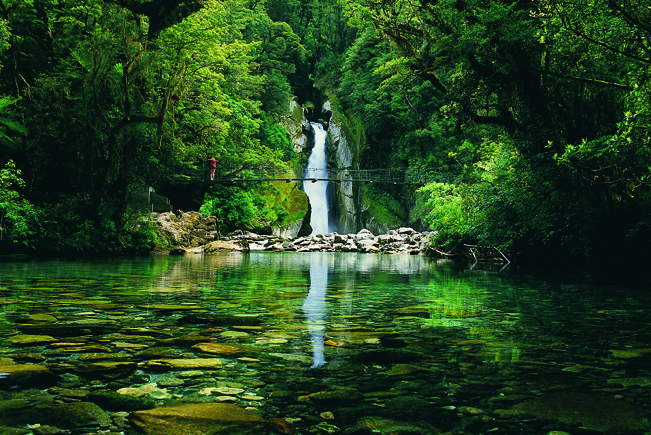 The Milford Track saves some of its best secrets for last. The final day boasted some of the most spectacular rainforest scenery yet, and I walked with my mouth almost permanently hanging open in awe. Bell Rock was a bit of a highlight, for obvious reasons (for those of you new to my blog, my last name is Bell). It’s a huge overhanging rock through which torrents of tumbling water have scoured out a cave big enough to stand up in. I had the obligatory cheesy photo inside the cave, but spent more time admiring the spectacular Mackay Falls right beside it. From here it got a bit messy. Warning: Those of you who can’t handle a bit of bodily function honesty, look away now. The section from Bell Rock to Poseidon Creek is all a bit of a blur. For one thing, the outside of my right foot was becoming excruciatingly painful, and I still had several hours to go. For another, my digestive system was starting to perform some rather alarming somersaults, the upshot of which was a sudden and desperate urge to…errr…go. I hobbled along the mercifully flat section of track at an alarming pace, oblivious to my impossibly beautiful surroundings, desperately hoping at every turn to see the next rest stop, complete with drop toilet. Several times I considered just squatting in the bushes, but then a Fiker or one of my fellow independent walkers would appear just behind or ahead of me. I clenched and sweated and swore and hobbled. I swear, in those uncomfortable few hours, my sphincter muscles got a better workout than my legs. At one point I could walk no further, and I sat by a swing bridge to adjust my boots. I removed some padding, loosened laces, and was on my way again. It seemed to do the trick, enough at least to make it to the finish line. Perhaps my feet sensed they were nearing the end, and were letting the full extent of their travail be known. Hang on for just a few more hours, I urged them. We can do it. Finally I spotted nirvana. A small wooden hut with the distinctive green portaloo nearby. I nearly got down on my knees and kissed the ground. Isn’t it amazing what the small things in life can do? I ate the last of my cabin bread and salami (if I ever see another stick of salami I am going to scream) and continued on, a renewed woman. Two more hours and I would be finished. To be honest, I was ready for the end now. I was tired. The track was still spectacular but I was noticing the beauty a little less, becoming accustomed to the extraordinary. A sign pointing to Lake Ada appeared on my right, pointing down a small track. I passed it by, and decided I would try to catch the 3pm boat. We had been warned time and time again about the army of insects awaiting us at Sandfly Point. Don’t arrive too soon or you’ll get eaten alive, warned the rangers. Pour a bottle of insect repellent over yourself before going within a mile of the place, they said. I stumbled into a small clearing with water tanks and a hut, and felt that vaguely melancholic sense of anti-climax one can feel after reaching a long sought-after goal. And…there were no sandflies. Not a one. I had done it. It was over. I hobbled to the famous sign, and one of the Fikers took my photo. I had five minutes until the boat left. Still no sandflies. 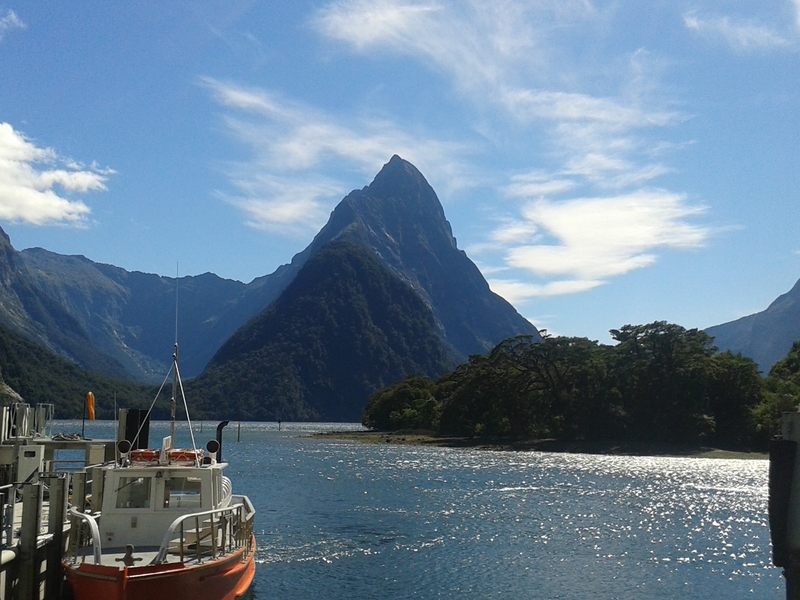 The boat took us past the majestic Mitre Peak to the shores of the tiny settlement of Milford. We emerged, blinking and limping, into civilisation. There was hot water in the bathrooms, and couches, and carpet, and vending machines. Tourists stared at us, dirty and smelly intrepid travellers from another time and place. We went straight to the pub. On the way, I stopped to take a shot of Mitre Peak. It rains here one day out of two, and seeing the peak in all its glory is notoriously rare. Today, it was the final blessing in a trip of a lifetime. That night in the backpackers’ hostel, exhausted and happy, I shared my experience with two young people who were booked to walk the track in two days’ time. I was on a high, and by the time I had finished with them they probably thought that walking the Milford Track represented the pinnacle of eternal ecstasy. I do hope I didn’t build up their expectations too much. …and I was still hungry after all this. My body was telling me in no uncertain terms that I had put it through A LOT, and it was now going to jolly well make up for it, thank you very much. For breakfast the next morning I had a meat pie, a giant pastry, lollies (sweets), and three more tangerines. I was in eating heaven. As I ate in the hostel, in a restaurant, in the bus back to Queenstown, and at the airport, I reflected on my experience. I was surprised as I realised that the best things had been not only the scenery and the walk itself, but also the company. I’m the sort of person who will always choose solitude over being in a group of people. I am energised by alone time, and if I don’t get enough of it, I get tetchy. So I wondered how I would cope on the track, cooped up with lots of strangers in small huts. As it turns out, I loved it. The people I met were interesting, adventurous, and funny. They were all so keen to find out about one another, to share their stories, to learn about the world. I was reminded how wonderful it can be to discover people from different backgrounds and cultures, and to be discovered myself. I don’t often let that happen. As I waited for my flight back to Auckland to board, I looked around me. Every single person was looking down at a device – a smartphone or tablet or kindle or laptop. And I realised that on the Milford Track, there was another dimension to our togetherness. We were all “unplugged”. There was no WiFi; no-one had packed a device. When I looked round the hut kitchen each night, everyone was looking up, at each other. We were unplugged, but more connected than ever.